It should come as no surprise that the inhabitants of countries with a high percentage of Russian speakers and either Russian-language media or local-language media owned by interests close to the Kremlin - or both - are influenced by media taking a line close to the worldview of Russian President Vladimir Putin. However, this is only part of the picture. There are more and more initiatives monitoring propaganda funded by the Russian state, but consistent, long-term policies to engage the countries of the former Soviet Union need to be combined with fostering high-quality media in the post-Soviet space and, let's not deny it, improving the quality of the coverage of events in Russia, Ukraine, and neighbouring countries by the western media. A Gallup poll covering 11 post-Soviet countries (including the Baltic states), conducted after the annexation of Crimea by Russia, found that residents in countries who used both Russian and Western media for information about Ukraine and Crimea were more likely to support Crimea becoming part of Russia than the national average. 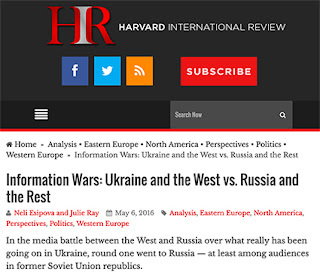 As Neil Esipova and Julie Ray of Gallup write for the Harvard International Review in Information Wars: Ukraine and the West vs. Russia and the Rest, for historical reasons the Russian media know their audiences well, while even those who use Western media "feel the distance in the Western media’s coverage". Several survey respondents remarked to interviewers that "Russian coverage goes much deeper into the issues that they find important and the Western coverage comes across as disaffected, lacking passion and failing to demonstrate an understanding of the region. Several also took exception with the Western media’s tone, which they said demonised Russia." It is hard to disagree that some western media coverage fails to dig beneath the surface, and - as Ukraine is now well aware - the attention span of the international media is quite short, moving on to new international troublespots, while Russian media continues to cover the region. Moreover, it is not just about countering propaganda (for example, one report by echo24.cz identified 42 Czech and Slovak websites "spreading Russian lies"). The Kremlin would love to tie up the government resources of the EU and United States in monitoring of (and responding to) Russian media reports - not least as it often just spreads their fake stories even further. 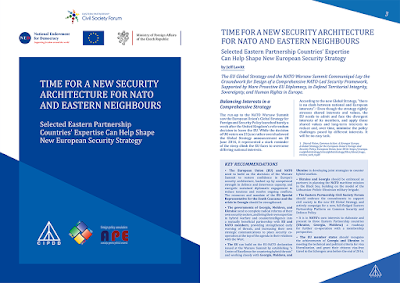 By all means, let's keep tags on propaganda, but the key is to formulate effective policies to embrace the post-Soviet countries into the democratic world, and to strengthen ties at all levels of society. One of the best ways to complement this is to invite more journalists from the region to spend some time hosted by western media - not only to learn about quality media in the western world (and of course the shortfalls in quality in western media), but also to make editors and journalists in the west more aware of the geopolitics in Ukraine, Moldova, Belarus, and the Caucasus, and what it is like to work in the media in the post-Soviet space. Who Will Be the New Messengers of the Kremlin? ⓒ New Diplomacy, z.s., 2015-2018. Feel free to quote, but please provide a link to the site. Watermark theme. Powered by Blogger.